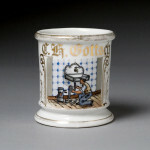 Plumbing mugs are fairly uncommon because indoor plumbing was not a universal feature of houses and buildings in many rural areas. Shaving mugs for plumbers often feature fixtures such as sinks, toilets, or tubs, sometimes the plumber himself is shown and other times simply the fixtures. If you need help determining the value of your Plumber’s Occupational Shaving Mug please don’t hesitate to contact us so we can help you.